New Clients: Caterpillar, Chamberlain, Covidian, Newell Rubbermaid & Midmark, Dentsply, ZF Transmissions., University of Stout Wisconsin, GE, Toyota, Carestream, Wistron, Aptar & Case New Holland. 01.12.15 – Design-Engine administers a special Creo 2.0 workshop to Midmark training. The participants of the training class all knew Solidworks so the course was administered as with that in mind. 01.26.15 – Design-Engine continues it’s interrelationship with Newell Rubbermaid North America by training over 100 participants total this week with two from Kalamazoo MI in a special Creo 2 course specifically to industrial designers. 01.13.15 – Design-Engine as a third party helped Badger Meter decide between the pros and cons of using Solidworks vs. Pro/ENGINEER’s Creo. 01.26.15 – Design-engine administers a special one week Level one Creo intensive to industrial designers and engineers from Rubbermaid. Each of the participants in this class have Rhino, Alias or Solidworks as previous experience. 02.09.15 – Design-engine administers a level one Solidworks class to industrial design professor from University of Stout Wisconsin. 02.23.15 – Design-engine administers special one week Ansys intensive to Stryker the medical company. 02.25.15 – Design-engine administers special week long surfacing intensive to Bic the pen and razor company in Athens Greece. This class was administered using Creo 3.0 that we recently released. 03.02.15 – Level one class to Covidien. 03.09.15 – Design Engine administers her ‘Specialty 7 day Creo intensive’ http://proetools.com/creo-training-industrial-design/ to Caterpillar Industrial Designers. Each of the designers already knows Alias or Rhino so this class maximizes what each participant can accomplish. 03.23.15 – Design Engine administers a ‘special 5 day surface modeling intensive’ http://proetools.com/solidworks-surfacing-intensive/ to industrial designers at Web Devlam of Chicago. This company specializes in Packaging and is owned by Motorola. 03.26.15 – Design Engine administers a two day sheetmetal workshop using Creo 2.0 to Rexnord. 03.30.15 – Design Engine administers another ‘special 5 day surface modeling intensive’ http://proetools.com/solidworks-surfacing-intensive/ to industrial designers at Web Devlam of Chicago. This company specializes in Packaging and is owned by Motorola. 04.06.15 – Design Engine administers a Level one Creo 2.0 workshop to ZF Transmissions. 04.06.15 – Design Engine administers our level 2 Creo 2.0 intensive to Midmark Corporation. This class covered specific conversion techniques for converting IGES data to parametric Creo 2.0 geometry, Assembly and Detail drawing basics to advanced techniques. Our partner MoveScience is helping on a large project with Midmark at this time. It is Design Engine’s job to help the Midmark staff engineering team understand the modeling workflow that MoveScience is doing on that project. 04.13.15 – Design Engine administers her ‘one week surfacing intensive’ http://proetools.com/week-one-full-week-of-creo-surfacing-isdx-intensive/ to the drone manufacture General Atomics of San Diego California. 04.13.15 – Design Engine administers a special ‘one week level 1 creo Modeling Best practices’ workshop to Rubbermaid industrial designers. 04.20.15 – Design Engine administers it’s special one week surfacing intensive as a follow-up to our recent level one to Rubbermaid industrial designers. 04.20.15 – Design Engine sends Bart Brejcha to Minneapolis MN to administer a specialty 3 day workshop to mechanical engineers at Select Comfort in Plymouth Minnesota. 04.27.15 – Design Engine administers a specialty surface modeling workshop to Energizer Playtex, Schick and Motorola together in one class with Bart Brejcha as instructor. 05.04.15 – Rubbermaid sends several for our specialty Creo Surfacing intensive specially designed for Rubbermaid. 05.04.15 – Bart Brejcha administers a five day Creo Cable Harness design workshop to Stryker. 07.27.15 – Rubbermaid sends several industrial designers and mechanical engineers for a special to Rubbermaid Creo Surfacing week long intensive. This surpasses 240 Designers and Engineers to go through two full weeks of training by Design Engine! 08.14.15 – Design Engine visited OTTO Engineering to administer a two day Creo Sheetmetal intensive to staff engineers. 09.21.15 – Karcher and Rubbermaid both send engineers for the Design Engine Creo Surface modeling intensive. This one week surfacing class is made up of three two day classes we offer. Call to inquire. 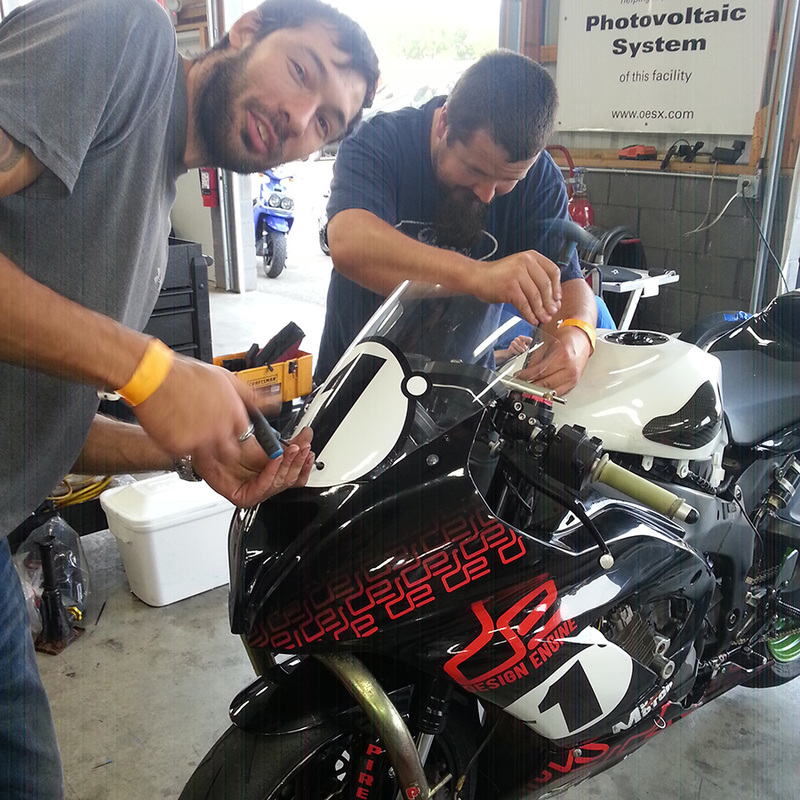 09.29.15 – Bart Brejcha and the Design Engine race team won 5 Expert Sportbike championships this year. All Middleweight & Heavyweight classes. Brian Kolasa is the team leader. Special thanks and hats off to those involved in the Design Engine racing program. special thanks to Scott Froemming the design engine videographer for helping us create some interesting race footage. 10.05.15 – Creo 3.0 level 1 Creo training to Schick, Stack-On & General Atomics. 10.23.15 – We typically run our Creo Surfacing class on the 4th week of each month. This month we have Edgwell the new brand for Energizer & Aptar in for training. 10.26.15 – Creo 3.0 level 1 Creo training to Johnson & Johnson & Midmark Corporation. 11.07.15 – Scott Froemming, Kaz Darzinskis & Bart Brejcha administer a 4 hour Solidworks class free to University of Illinois Chicago – UIC Industrial Design Students this Saturday in Chicago. 11.09.15 – Design Engine offers her two day Creo Sheet Metal Training An intensive to various Rubbermaid brands in Atlanta GA this week. 11.16.15 – We usually offer the design engine surfacing class on the fourth week of each month except for Nov & December. Because of demand we offer it this third week due to the USA Thanksgiving week. Creo Surfacing class This month we have Wistron, Aptar (again) and Case New Holland the new brand in for the Creo Surfacing Intensive. 12.07.15 – Bart Brejcha offers a special custom week three to Rubbermaid Industrial designers in Kalamazoo MI this week. This intense review of surfacing tools inside of Creo is intended to facilitate the use of Creo 3.0 instead of Solidworks and look at G2 light reflections. The participants all previously took the Design Engine surfacing week a year before. This move was intended so the ID deliverable to ME are smooth and concise where engineers don’t have to remodel products for production. 12.07.15 – Matt Holter administers his Creo 3.0 level 1 Creo training to Rubbermaid Industrial Designers & Engineers this week in Kalamazoo MI. This special workshop designed specifically for ID’ers gets into surfacing the fifth day of this class. The participants all have previous Solidworks, Rhino or Alias experience. 12.14.15 – Last Creo 3.0 class of the year. This level 1 Creo training class was held to Hayes Performance Products, Covidian & Chamberlain. The participants were all very fast as we were able to cover much more than normal in this Creo class over others. One item to note was that the participant from Hayes Performance is a professional Motard racer with AMA. We at design engine like that racing stuff.